The year 2013 is memorable for the increasing liveliness of discussions about the future of Sino-Russian relations. When Xi Jinping made his first visit as president in March to Moscow to meet Vladimir Putin, whose posture in starting his third term as president was decidedly more critical of the United States, interest was mounting in how much closer bilateral relations would be. Already there were signs of rising Russian arms sales to China. In May, as covered in the Country Report in Issue 1 of this journal, articles by Alexander Lukin and Zhao Huasheng suggested that debates about upgrading relations were raising expectations, which specialists were keen on restraining, since they defied Russia’s interest in multipolarity and in opportunities elsewhere in Asia. In a ten-day, mid-summer span more articles—by Zhao and also Evgenyi Bazhanov, Lukin’s superior as rector at the Diplomatic Academy—took the discussion to a new level by giving serious consideration to the idea that the two states should form an alliance. While disagreeing with that goal, they presented the arguments for and against, giving readers a window on a once little-known debate. In September, The Asan Forum’s Special Forum posted articles by Lukin and Cheng Xiaohe, which expressed parallel reasoning in strategic thinking about North Korea. 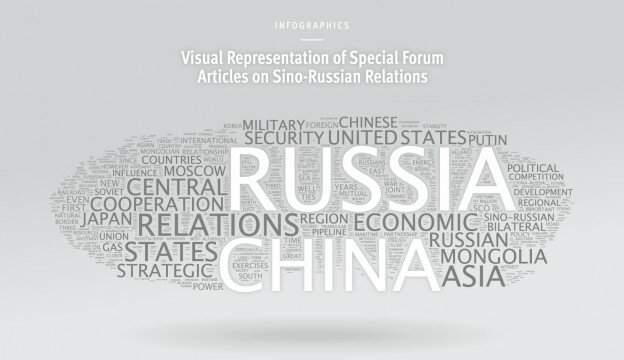 With this new Special Forum we probe triangular Sino-Russian relations further. The triangularity inherent in Sino-Russian relations became more evident in the fall of 2013. Xi’s September tour of Central Asia set forth plans for a Silk Road economic belt, just as Putin was intensifying pressure for a Eurasian Union. When they met in Bishkek at the SCO summit, the limited agenda reflected their efforts to stymie each other’s visions. The 2+2 meetings on security and foreign affairs between Japanese and Russian officials, as discussed in Hyodo Shinji’s article in this Special Forum, may have kept the focus away from China, but clearly Sino-Russian differences in dealing with Japan were on display. Also, in November, Putin’s visits to Vietnam and South Korea highlighted approaches to development in maritime Southeast Asia and the northern corridor of Northeast Asia at odds with China’s agenda. Although there was no sharp divide in the way Beijing and Moscow were dealing with Washington, the old strategic triangle loomed in the background as other triangles drew notice. The articles that follow reflect three different approaches to Sino-Russian triangles. Those by Li Jing jie and Zhao Huasheng—significant academic figures in the conduct of Chinese foreign policy with Russia—are indicative of a point of view apparent over the past two decades that bilateral relations must be put in the most positive light, the US triangle is solely a source of shared thinking and cooperation, and the SCO is a great success with no serious strains. In this perspective, relations are a success, have never been better, and face no serious strains. In contrast, the articles by both Hyodo and Andrew Kutchins are representative of a skeptical attitude toward such claims in Japan and the West, arguing that relations have not been as positive as official statement indicate, they are increasingly strained by assertive Chinese moves, and divergence is readily apparent in triangular contexts. The final article by Sergey Radchenko provides a specific case study of the Mongolian triangle, pointing to Sino-Russian competition but also suggesting how China gains the upper hand by its economic prowess without directly antagonizing Russia in a manner that would call into question claims about their growing amity and close strategic partnership. The case for forging an alliance emerges clearly from recent writings and, no doubt, even more assertively from internal sources by real alliance supporters. The first, unmistakable premise, is that the United States, regardless of the earlier “reset” to Russia and June 2013 Obama–Xi Sunnylands summit, is on the offense, putting more pressure on both Russia and China. There is an unquestioned argument that Obama is striving to keep these two countries down, applying “strategic pressure” because he flinches before a “Cold War” mentality prevalent in the United States. This does not correspond to what US leaders claim are their policy or intentions, but there is no explanation of this discrepancy. A second, disputed premise is that the world and East Asia are increasingly polarized, raising the urgency of taking sides. In Chinese sources the Sino-Japanese territorial dispute is often put in this context, as is US interference in maritime disputes over the South China Sea. Russian doubts may be more pronounced, but the same assumption is prevalent, despite ambiguity about these two conflicts involving China and also about efforts to downplay the theme of multipolarity. Russian critics of an alliance are cautious about directly confronting Putin’s “success” in drawing closer to China, but they are on firm ground when they rest their case on the unassailable goal of multipolarity. Even as momentum toward forging an alliance was growing, the appeal to multipolarity left an opening to resist. The case against upgrading Sino-Russian relations into an alliance centers on two principal arguments, both triangular in nature. The first holds that relations with the United States for each country do not warrant recalculation of national interests in such clear-cut opposition that an alliance would be justified. They have cooperated in opposition to the United States since 1996 without seeing a need to harden their stance into an alliance. What has the Obama administration done to change that calculus? The second argument is that along their borders, divisions between China and Russia are hardening. With new ambitions for sinocentrism and Russocentrism, it is hard to imagine that two such insistent, centrifugal forces could be reconciled even if the former mostly targeted the United States and Japan, while the latter primarily targeted the United States and the EU. In the countries of Central Asia and Mongolia, the overlapping gravitational thrust cannot be hidden. Discussed below, Xi’s Central Asian trip, followed by Chinese and Russian commentaries, has turned attention from talk of an alliance to hints regarding clashing spheres of influence. Triangles were important in the period of the Sino-Soviet split. Divisions over India helped to fuel the dispute in its incubation stage. Rivalry over North Korea allowed a third party to gain leverage. Mongolia served as a source of tension, recalling clashes over historical justice. When invectives were hurled back and forth, the accusations against the other state’s conduct in Central Asia as well as Xinjiang were among the most vitriolic. Of course, the strategic triangle involving the United States is readily remembered as a test for Sino-Soviet relations from the Soviet embrace of peaceful coexistence, kindling the dispute, to the Sino-US breakthrough, exacerbating it, to the maneuvering of the 1980s in Beijing’s pursuit of equidistance and Moscow’s late effort to improve ties with both states and end its strategic isolation in East Asia. In three decades of Sino-Soviet confrontation and lack of normalization, managing the triangular context—competition over leadership in the communist bloc, maneuvers in the superpower standoff, and the use of carrots and sticks to gain an advantage in regional reorganization—often overshadowed bilateral contacts of the two states. Triangles acquired different meaning over the quarter century since normalization in May 1989. Instead of a ruthless competition to prove which country is the true ideological center of communism, the two states only dealt with communism in the context of relations with North Korea with ideology no longer dividing them. The end of the Cold War meant that there was no longer polarization between two blocs; so relations with the United States could be addressed in a different manner. Also, at the regional level, the end of the Soviet Union and the Soviet camp opened six states from Mongolia to Tajikistan to possible competition, while putting Japan, which was leaning to China, and India, whose ties to Russia were stronger, in a new light. Three phases of triangularity in the post-Cold War era can orient us to the overall changes. The period of the 1990s saw limited Sino-Russian coordination and weak triangles. The principal success was in setting aside the tense triangular competition of the Sino-Soviet split era, noteworthy especially because of the power vacuum that one or the other great power could have tried to fill at the expense of the other. North Korea did not benefit as its relations with Moscow were insignificant and summitry with China did not occur, a sign of its marginal relationship. Washington did not see the strategic triangle as any longer relevant, separating relations with the two states at the same time as they were prioritizing their relations with it. Only later in the decade and in limited fashion did Japan take seriously the idea that a breakthrough with Russia would have a strategic dimension relative to China. This was a decade of unipolarity and minimal balance of power activity. The Shanghai-5 played a positive role in stabilizing Sino-Russian relations linked to Central Asia, the primary concern. One key to successful management of potentially explosive differences was Chinese deference to Russia, pragmatism in resolving border disputes, and incentives to the states newly active diplomatically. Another key was preoccupation with the conduct of the United States, its allies, and the international organizations under its sway. The low priority of Asia for Russia eased the way to accommodation as if triangles in a regional context mattered little, as the United States and EU stood in the forefront. For the decade of the 2000s triangles were of increased importance, but they stayed under control without giving rise to serious contestation. As Sino-Russian ties grew closer, they forestalled open flare-ups of rivalry over third countries. Conditions for triangular maneuvering were ripening, but the absence of intense competition calls for some explanation. First, Sino-Russian mutual restraint deserves attention. Then, US inattentiveness to Sino-Russian relations warrants clarification. Finally, the lack of triangular testing from states in the region, beginning with Japan and India, must be examined. If the 1990s are easier to explain in terms of conditions that were not ripe for triangularity, the 2000s require more scrutiny for its abortive development. One explanation for the relative quiet of the 2000s was Sino-Russian consensus on the need to work together against Bush’s unilateral global offensive. Another was the diplomatic passivity in Asia of other great powers, notably Japan and India. A third explanation is that on the two serious confrontations at both ends of their new, overlapping spheres of influence—Afghanistan and North Korea–, they had similar outlooks in the short run, if different long-term interests. In this decade, too, Russia was mainly looking away from Asia and China was mainly focused to the southeast and east, away from contested areas with Russia. The SCO served effectively to deal with challenges in Central Asia, despite conflicting approaches to its economic and security functions. China proceeded to boost energy and other economic ties to the Central Asian states on a bilateral basis, while Russia retained considerable leverage bilaterally and through the CSTO, its own multilateral security organization. Given a need to move supplies through Central Asia for the war in Afghanistan, Washington took a low-key approach to developments except when Kyrgyzstan erupted in 2005. In the 2010s triangles are acquiring a different role. Neither Beijing nor Moscow is as deferential to Washington as before. In opposing it, they recognize that they need each other still, but they also are emboldened to take risks that test bilateral ties. In 2013 their policies toward Japan are dramatically different, as Xi demonizes Abe as the heir to pre-1945 warmongers and Putin woos him as an economic partner with energy in the forefront, as a limited security partner, and additionally, as a state that at least is contemplating the cooperative resolution of a territorial dispute that is linked to the legacy of the war. Even more obvious is the gulf between Eurasianism and sinocentrism, which puts the SCO in a new spotlight as Putin pressed from late 2011 to establish a new entity called the Eurasian Union, which many equated with the revival of the Russian Empire or even the Soviet Union, and Xi countered in late 2013 with a trip to Central Asia heralding China’s Silk Road regional architecture. In the summer and fall of 2013 it was clear that Putin was playing hard ball with the states of the former Soviet Union, ranging from Ukraine and Armenia to Kyrgyzstan, to join Russia’s grand design for a Eurasian Union and to resist temptations to enter rival regional integrated associations, especially the EU but also the creeping China-designed plan for integrating areas to the west, which Xi labeled the Silk Road. While the struggle with the EU over Ukraine gained the lion’s share of attention, that over Central Asia had the greatest potential to shake up great power relations, especially when it brought into the open Xi’s determination to extend the assertiveness found in China’s policies focused on other neighboring sub-regions to the west. Centering his gaze on the western reaches of the former Soviet Union, Putin was leaving open its southern expanse for Xi’s full-press advance as US preoccupation was elsewhere. On the surface, this is a struggle, seemingly of a bygone era, over exclusive economic zones. Russia focuses on forging a Eurasian Customs Union, rejecting not only joint membership of countries in the EU, but also an SCO FTA or anything like it that can boost China’s economic foothold in Central Asia. Yet, what is at stake is also strategic partnerships, as Russia persists in objecting to the expansion of NATO to the east or of the SCO into a full-fledged security community, while also seeking security ties that recognize its preeminence in post-Soviet space. There is more to the concept of Eurasianism. It has an unmistakable cultural component, insistent on acceptance of Russia as a civilizational pole and gravitation to it in language and even ideology. If Russia’s economy has no capacity to compete with the EU or China’s economic clout and Russia’s military falls far short of providing the security umbrella others seek, its civilization, now bereft of communist ideology, has little prospect of acting as a magnet to draw other nations closer. Indeed, xenophobia and even pogroms aimed at Russian citizens and others from the Caucasus arouse revulsion about its culture. Yet, China also operates from a deficit of soft power, which complicates its relations. On September 7 at Nazarbayev University Xi Jinping unveiled his plan to establish a Silk Road economic belt. Chinese portrayed it as a response not only to the earlier US plan, deemed part of “rebalancing” to Asia, for an Afghanistan-centered, north-south “new Silk Road” uniting South and Central Asia, but also to the Eurasian Union advocated by Russia to restore its status as a great power, reconnecting Central Asia and Russia. China’s scheme is conceived as something even grander: linking Asia and Europe, connecting the various regions of Asia into one overarching structure with China as the center; and allowing room for the United States and Russia to have a role but not the kind of influence that either power has in mind. Insisting that this more far-ranging blueprint, backed by assurance that China would never seek to establish its hegemony or a sphere of influence, would not infringe on Russia’s interests. Chinese also invoke the tradition of the old Silk Road, claiming that it is “deeply felt in the heart of the nation.”1 Apart from the breadth of its conception, the historical roots behind it, and the extended borders China has with the Central Asian states, Chinese also point to their greater economic resources. Citing aspirations in the South Caucasus, they argue that the scope of this belt should extend there too. In mid-September when Xi visited Kyrgyzstan, China’s media argued that a strategic breakthrough had been achieved; all five states in Central Asia now have strategic partnerships with China. In the same visit his hosts welcomed China’s establishment of a Silk Road economic belt, acknowledging the importance of Chinese investment, especially in the pipeline transporting gas from Turkmenistan to China.2 Xi’s visits to the five states overshadowed the SCO summit, posing a challenge to Putin, who then visited Vietnam and sent two ministers to Japan as his own challenge to China. China’s western ambitions do not stop with Central Asia. It has set its sights on an expanded SCO inclusive of India and Iran. Sino-Russian relations would presumably be subsumed in this larger grouping, greatly diminishing Moscow’s clout, but given its rising power and economic prowess, not China’s. On Sept. 11 an opinion piece in Huanqiugang explained the reason for Xi’s exceptionally long 11-day trip through Central Asia, culminating in the SCO meetings. It shows a new priority for Central Asia. It offers an opportunity to unveil the plan for the new Silk Road economic belt. As its namesake dating back two millennia, this east-west corridor also serves as a cultural bridge, readers are told. Since Central Asian states became independent, the article argues that they have valued their advantageous location as an east-west bridge.3 Omitting any mention of Russia’s role in the region or of historical periods when Central Asia has been under Russia’s control or under its sway, the article shows no indication of further deference to Russia or to the north-south orientation of this inland region. China’s “advance to the West” (xijin) was at last being clarified. A month later the competitive nature of China’s push into Central Asia was no longer left to the imagination. Not only did Chinese acknowledge its opposition to strategy in the West but the divergence with Russian strategy was explicitly set forth too. For the United States, withdrawal from Afghanistan is leaving a vacuum, extending to the north, despite continued US intentions to be active in Central Asia to shape the relations of states there with China and Russia. Yet, given that all of the region’s states are conducting diplomacy of balancing the great powers, this provides the United States with an opportunity, if its future relations with Afghanistan as well as Pakistan prove supportive. As for Russia, Chinese sees its aims of union with Central Asia as beyond its capabilities. It is too weak a power to keep this region in tow. Even in Kazakhstan the opening of a new oil pipeline to China, however nervous it makes Russians, will be understood as a way to export more Russian oil as well. In need of Chinese support for its political activism in other regions, from the Middle East to North Korea, Russia is no longer in a position to object very strongly to the more assertive posture China is taking in Central Asia. What it could not achieve through the SCO, blocked by Russia, China apparently has decided to pursue on its own. An October 14 article in Nezavisimaya gazeta cited two new articles in Renmin ribao that criticized Putin’s Eurasian Union, claiming that many countries targeted for Putin’s union should be considered within the Silk Road, whose economic belt was treated in the Chinese paper as superior to Putin’s regional concept as well as an earlier US one. It is far grander in scale, reaching three billion people. It starts with substantial financial resources and a development blueprint. It does not interfere in the internal affairs of the other states (implicitly suggesting that Russia’s plan does). Finally, it can readily be combined with Russia’s Eurasian Customs Union, as if that is some sub-regional entity of more minor significance.4 Clearly, Russians are concerned. Russia seeks multipolarity and is looking for a sphere in which it stands as the center, economically, politically, and, no less importantly, civilizationally. China is pressing for bipolarity, rallying the inner reaches of Asia into an enlarged SCO, whose functions would range from energy networks and economic integration to strategic cooperation and even civilizational overlap in opposition to the US-led international community. This contrasting approach continues to be obscured by similarities in opposing the United States in the principal great power triangle for both countries. Yet, as the articles that follow discuss in the Eurasian Union and the Silk Road as well as in policies to Japan, Asian triangularity is exposing a wide gap. The five articles address a common set of questions. One, what is the nature of the clash in national interests between China and Russia in this triangular context? Two, is the clash growing more serious or becoming less so? Three, how well are Moscow and Beijing succeeding in discussing their differences and understanding each other’s point of view? Four, what is the impact of countries outside of the triangle on this context, positive or negative? Five, if there should be an alliance, how would that affect this triangle? In answering these questions, authors are considering not only their own understanding of international relations, but also how publications and officials in each of the three countries within each triangle are assessing them. 1. Renmin ribao online, October 10, 2013. 2. “Sizhou zhi lu jingji dai: zhanlue jiangbai Zhongguo yu Zhongya guojia fazhan tuixiang genggao jieduan,” Renmingang, September 10, 2013. 3. Wu Hongwei, “Zongya shi Zongguo ‘xijin’ zhanlue zhitian,” Huanqiugang, September 11, 2013. 4. Mikhail Sergeyev, “Beijing Moves Putin’s Project for Eurasian Union Aside,” Nezavisimaya gazeta, October 14, 2013.